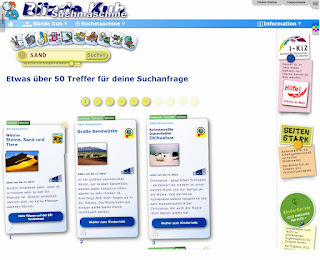 The children's search engine "Blinde Kuh" is the oldest of its kind in Germany. It was developed by Birgit Bachmann and started in 1996 as a private project under the name "Birgits Kinderseiten". The internet pages of Blinde Kuh were voluntarily operated from 1997 to 2004 by the association "Blinde Kuh e.V.". Since 2004 it is also supported by the Federal Ministry for Family Affairs, Senior Citizens, Women and Youth. The "Blinde Kuh" is offered in German and Turkish. Blinde Kuh uses manually selected white lists with Internet sources, which are regularly visited by the search engine's robot. In addition, they work with children's sites, which provide them with data in various forms. For each web page data sets are created, which are enriched e.g. with categorizations, a short description and age recommendations. 1997 - 2004 Blinde Kuh e.V. The SeEn is called after the children's game "Blindekuh" (in English "Blind man's buff").